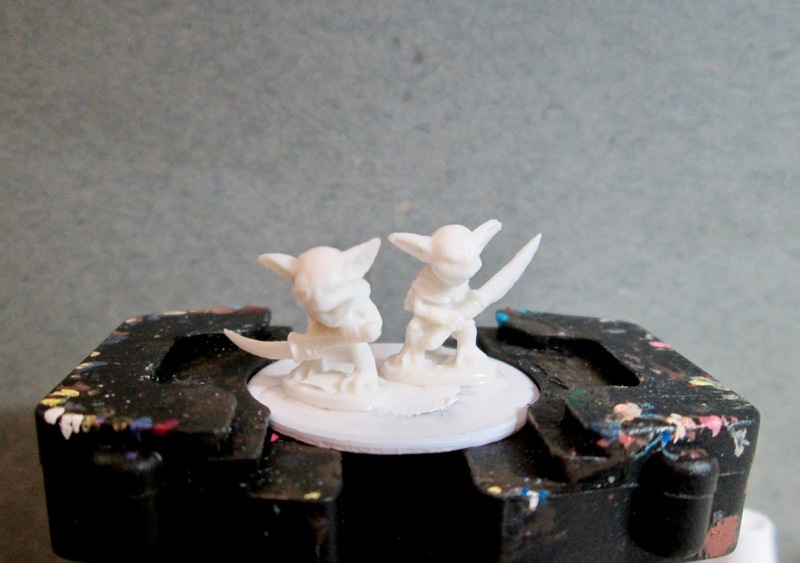 Gremlins: Bones 3 figures | H.A.W.K.S. This past weekend was our club’s 2-day regional gaming con, BARRAGE; so knowing I’d be involved in a lot of work for that, I picked something really easy, and selected half the Gremlins set from the Bones 3 Stoneskull Expansion. 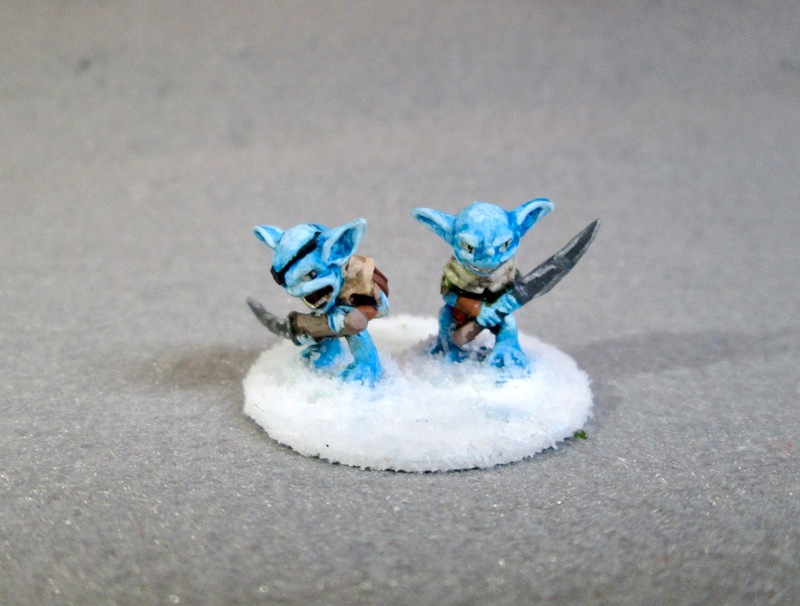 To me, these guys looked very similar to the Pathfinder Goblins, that I had painted back in 2014 to be Snow Goblins. 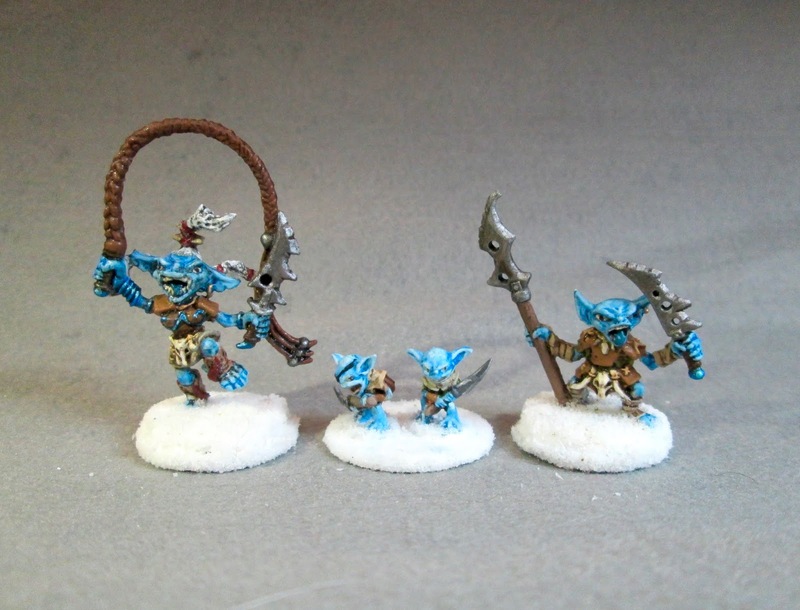 So I thought I’d paint these the same way, to be Snow Goblin kids; and mount 2 to a base, then mix them in with the regular Snow Goblin force. I prepped the figures in the usual way; soaking them in a dish of water with a couple drops of dish-soap added, then giving them a light scrub with a soft toothbrush, and then rinsing and drying them. I then glued the pair of figures to a white-primed 1" fender washer with Aleene’s Tacky glue, and then placed them in my painting grip. 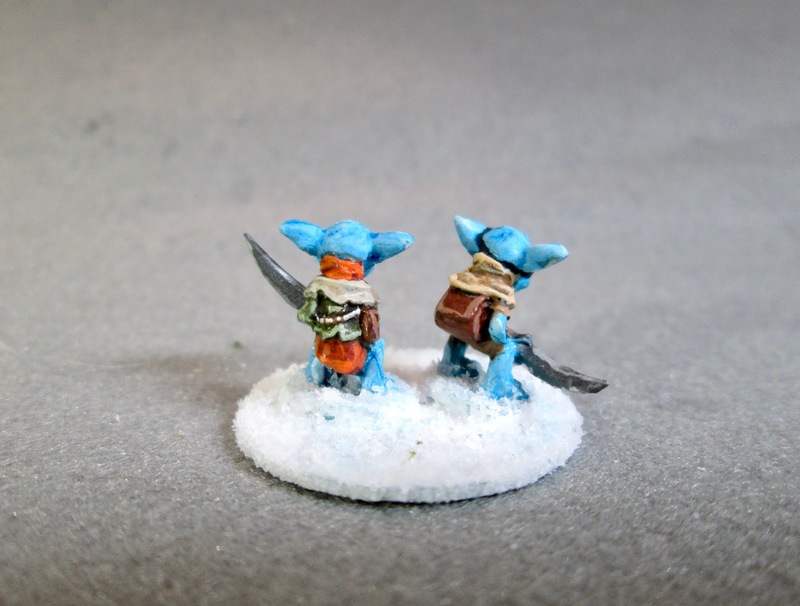 I began by giving the figure a wash with Reaper MSP “Blue Liner”; and when that was dry, I painted both of the figures with Reaper MSP “Frosty Blue”. When that was dry, I gave the figures a wash with Iron Wind Metals “Medium Blue” Ink. When the ink was dry, I painted the under tunic on the one on the left below with Crafter’s Acrylic “Ornage Spice, his over shirt with Duncan "Olive Green”, and his collar with Folk Art “Porcelain White”. The one on the right I painted with Reaper MSP “Olive Skin” for the under tunic, Americana “Light Cinnamon” for the backpack, and Apple Barrel “Apple Maple Syrup” for the collar. I then painted the teeth and the string on the left ones back with Americana “Light Antique White”, the knife handles with Americana “Mississippi Mud”, and the blades with Americana “Zinc”. Around the back, I painted the pouch on the lefthand one with the Light Cinnamon". Then, when everything was dry, I gave the clothes and wepaons a wash with Citadel “Agrax Earthshade"wash. I was as careful as I could be not to let it run onto the blue skin, except I applied small amounts to the eye sockets and mouth. After the wash had had time to dry, I went back and added highlights. 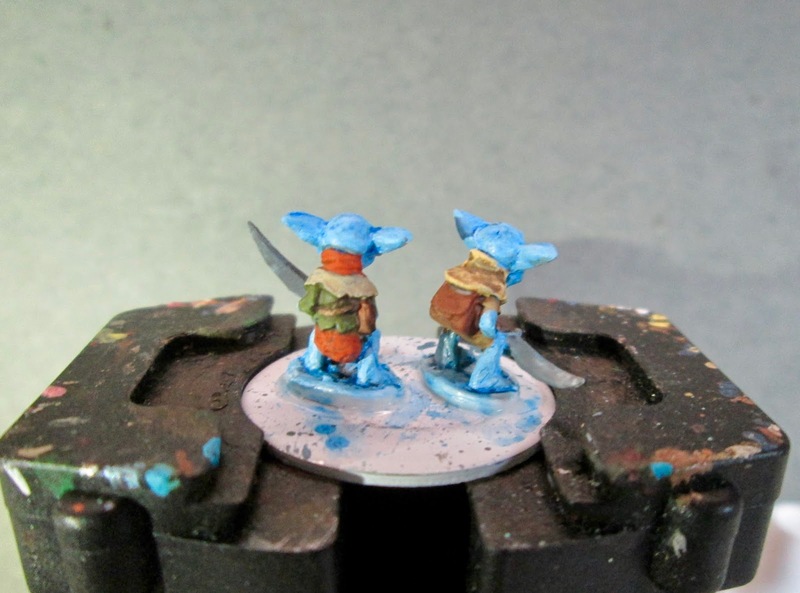 I began by highlighting the skin with the original "Frosty Blue”. 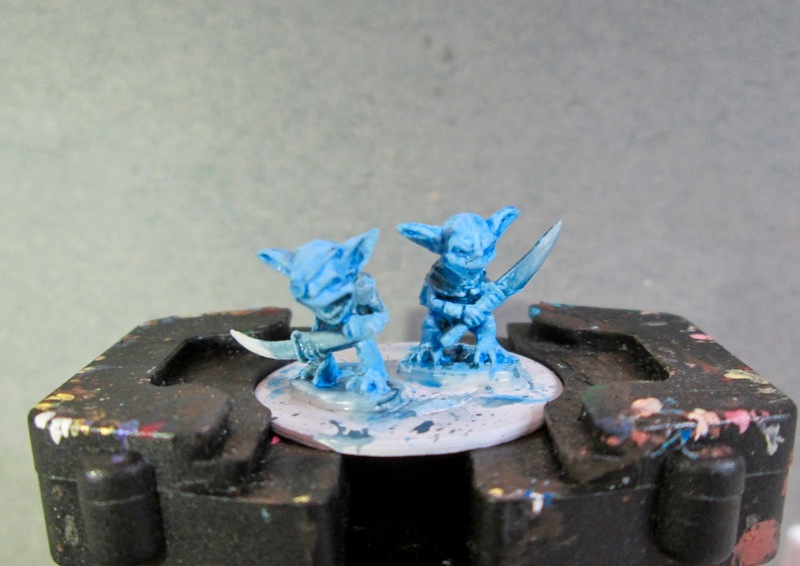 This allowed me to cover any mistakes where wash, or the drybrushed white had gotten onto the blue. Next, I added eyes with the “Antique White”, and then added black pupils. I also used Crafter’s Acrylic “Light Antique White to highlight the teeth and the rope on the back. Next, I painted the eyepatch with Ceramcoat "Black”. Lastly, I painted the base with Ceramcoat “Snow White”. I let them sit overnight, and the next morning I gave them a coat of Americana “DuraClear Matte” varnish. Later that afternoon I flocked their bases, using Woodland Scenics snow flocking. Another overnight dry, and I sprayed them with Testor’s Dullcote". Ma and Pa take the kids out for a little raiding trip! 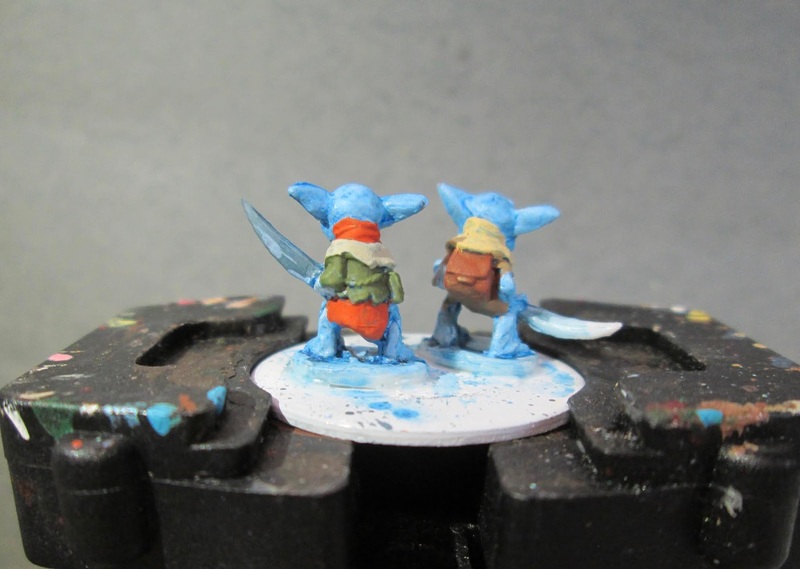 I’m happy with these little guys, and, as hoped, they proved to be an easy job to get painted up. Nice paint job! The “family” look excellent! Very fun Chris. Love the blue skin. Great to see you this weekend, only wish I could have gotten in your game (or you in mine!). Thanks, Mark! It was great seeing you too. It was a shame our game schedules didn’t work out.